Microsoft Exchange Server is a widely used mail server. It has been used in the large companies and enterprises for the purpose of calendaring, managing contacts and, much more. Initially, Microsoft Server was started as XENIX messaging based client way back in 1993. It took Exchange server three years to develop fully and in the year 1996, XENIX server tag was removed from Microsoft Exchange. It Started from Exchange Edition 5.0, and there had been 6 editions of MS Exchange server around. Among which Exchange Server 2016 is the current one. 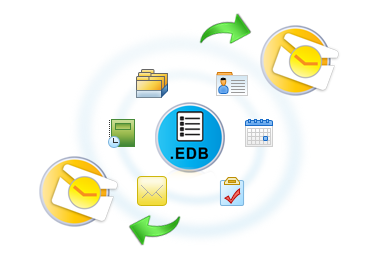 Go through the article to explore EDB Mailbox to PST conversion method. The article is fragmented into sections, which will narrate the scenarios that may lead to corruption issues in Exchange Server. Various methods are mentioned below with the help of which one can implement to export public folder EDB Mailbox to PST Outlook. Before continuing to the other section one should have a look at the overview of the database of the Exchange server. Exchange server has the ability to store its information in the information store of Public and Private. EDB and an STM files are linked with both of the private and public stores. The public store contains two files – pub1.edb and pub1.stm files. Pub.edb file comprises of the messages sent by the MAPI Client. The pub.stm consists of the messages sent to Exchange from the clients of MIME. The public folder is always admin secured and the admin defines users that have right for the folder to be accessed. The private store includes the information associated with a particular account of the mail. It comprises of the two files one is priv1.edb and the other is priv1.stm. All the messages that are sent by the MAPI clients are stored by Priv.edb files whereas all the messages and the streaming data sent by MIME clients are contained by priv.stm. The dirty shutdown of Exchange server. JET Database Engine error in Exchange. Malfunction of an application in the system. Power failure leading to Exchange crash. Corruption in the header of emails in the mailbox. Deletion of some emails in Exchange database. Malware infections in Exchange Server. Why Export Public Folder EDB Mailbox to PST Format? If one has to access EDB files in Outlook, he/she can migrate them into OST and PST files. One of the basic advantages to export public folder EDB Mailbox to PST is that the PST Files of Outlook are not MAPI-tied as in the case of OST files. MAPI–tied means that OST files can be used in same profile in which it was configured. Hence, its data becomes restricted to that particular profile. In contrary to it, Outlook PST files are previewed in any of the MS Outlook profile therefore, one can access his/her data in any Outlook profile. For looking into the corruption issues linked with the Exchange server, Microsoft has introduced many utilities in the case to export corrupted EDB mailbox to PST. One of the utility is ExMerge (ExMerge.exe) but it works only up to the MS Exchange 2007 version. But in the case of the above versions, it is suggested to make use of command named as PowerShell. These both are the free utilities and recover the corrupted EDB files and then export them to the public folder EDB file to PST. One can use these to repair a single, multiple or every mailbox that is stored in the MS Exchange server mailbox. Instead of the corruption issues, people opt for the cross-forest migration to export public folder EDB Mailbox to PST. As the EDB files are not supported by the MS Outlook, therefore the need of migration to PST files occur. In the section mentioned above, we have told the users a relevant way to export the files.